Historian drs. Armand Sag was born in the year 1984 in the Dutch city of Utrecht, where he grew up and went to school. In his early years he played the lead in a musical, when he was eighteen he worked in a disco, was a male model for over four years and also worked as a chef in a döner diner. Armand Sag also had a passion for sports, playing atletics at a professional level. This all changed when he went on to college and even to the universities of Utrecht. He focused on his study and stopped with everything else. But it wasn't for long till Armand Sag became active in the student society. In 2004, while attending the University of Utrecht [in Dutch: 'Hogeschool van Utrecht'] in the Netherlands, Armand Sag finished his Teacher College: History and State Apparatus propaedeutics 'with greater honor' and went on to attend Utrecht University [in Dutch: 'Universiteit Utrecht']. In 2005 and 2006 he founded various student organizations like 'The Comity To Preserve Turkology', 'Research Group Focus 1915' and 'Turkish Dutch Student Association Erkin', thus becoming the founding chairman of all three. In 2008 Armand Sag announced his immediate retirement from student organizations, and was chosen honorary chairman due to his accomplishments and efforts. His most known activities were the student protests he organized; in 2005 some 25 students protested against the decision to abolish the Turkology/Turkish Studies department from Utrecht University, while in 2006 approximatly 200-250 students protested against the use of the Armenian Issue as a political tool. In 2007 the organizational talents of Armand Sag reached a peak with a student protest march in which 7000-8000 student participants were present to denounce terrorism. He graduated from Utrecht University with a bachelor History 'with great honor' and a minor Turkology 'with highest honor' in 2008. The bachelor thesis of Armand Sag was about the Janissaries in the Ottoman Empire from 1425 until 1550. He received his master's degree in International Relations with the international 'upper class'-grade average (or 'with honor') at Utrecht University in 2009. His master thesis dealt with the emerging international relations between the Netherlands and Turkey from 1612 onwards, thus making his specialization Turkish History. In 2010, at the age of 25, Armand Sag founded the Institute for Turkish Studies [or 'Instituut voor Turkse Studies' in Dutch], where he is currently working as chairman and senior researcher. As senior researcher, he focuses mainly on issues around Turkology, Turkish history and international relations of Eurasia (specifically: the Balkans, Caucasus, Central Asia, the Middle East and the Turkish-Dutch relations). Within the institute, he is the founding editor-in-chief of the academic journal 'International Review of Turkish Studies', which is published by the Institute for Turkish Studies. 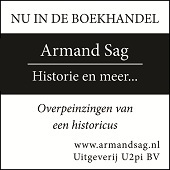 From 2008 to 2010 Armand Sag was working as a historian at a Turkish history museum called 'Museum Turkey - The Netherlands' in the city Hoorn, the Netherlands. In addition he also worked (and still does work) as a researcher, writer and translator for various organizations and institutions. Armand Sag is currently also a Ph.D.-fellow, earning his Ph.D. in history in the field of the Ottoman Balkans during the period of 1908 until 1923, more specifically the Balkan Wars of 1912-1913. Due to his academic career ambitions, Armand Sag regularly gave classes at Utrecht University during his master's study. Besides this, Armand Sag also participated in various projects, like the creation of a new Turkish-Dutch dictionary by Utrecht University, and supports research journalists in their quest for Turkish sources. He organizes debates, lectures, discussions and conferences concerning historical en political issues on a regularly basis. Apart from this, Armand Sag also gets invitations to act as a key note speaker at academic and/or scientific conferences and other gatherings which are organized by others. Finally, Armand Sag is executive editor of multiple media institutions. In December of 2010 he completed his first book, 'History and more; musings of a historian' [the original title is: 'Historie en meer; overpeinzingen van een historicus'] which came out on April 22nd, 2011. The book is currently on sale at all major bookstores in the Netherlands as well as on online internet bookshops, including the biggest online bookshop of the Netherlands: the well-known Dutch Bol.com website. His second book is 'Revolutions in the Middle East: Perception and Consequences' [the original title is: 'Omwentelingen in het Midden-Oosten: Perceptie en Gevolgen'], edited by historian Dr. Perry Pierik and published by Aspekt Publishers on May 22nd, 2012. Besides Armand Sag, who submitted his contribution to the editorial book in December 2011, authors consist of former Belgian prime minister Guy Verhofstadt, former Dutch prime minister Dries van Agt, former Dutch minister Laurens Jan Brinkhorst and Turkey expert Maurice Becker. The book is available in all major bookstores throughout the Netherlands, including Bol.com.His third book 'Learning Grammar of Turkey-Turkish' [the original title is: 'Leergrammatica van het Turkije-Turks'] came out on October 1st, 2013 and is currently used by various Dutch universities. The book is available throughout the Netherlands. His fourth book 'Nation-building and historiography in modern Turkey: Anatolia, the Balkan and geographical emphasis' is also his first English-written book. It was published on December 24th, 2015 and is available in all major bookstores. His fifth book was the editorial book 'Erdoğan: Perceptie, Reflectie, Analyse [the original title is: 'Erdoğan: Perception, Reflection, Analysis'] (Uitgeverij Aspekt, 2017). To see a more complete list of his academic publications, click here. Drs. Armand Sag was affiliated with the Municipality of Utrecht ['Gemeente Utrecht' in Dutch] as a board member of Saluti: Urban Advisory Board for Interculturalization ['Saluti: Stedelijk Adviesorgaan Interculturalisatie' in Dutch] from 2011 until 2014. He also has a weekly column in Turkish called 'Contemporary Europe' ['Avrupa Gündemi' in Turkish] for the Academy for International Politics ['Uluslararasi Politika Akademisi' in Turkish]. He also has a monthly Dutch column called 'My thoughts' [or 'Mijn overpeinzingen' in Dutch] in Platform Magazine. The Dutch quarterly magazine Tulpia also published articles by Armand Sag on a regularly basis. Furthermore, he writes articles on international relations for Volkskrant Newspaper, NRC Next Daily and the news portal Alles In Perspectief.nl [or 'Everything In Perspective'], where he also worked as the editor-in-chief from 2010 until 2012. 9.	his conclusion that the Ottoman happenings of 1915 do not constitute the term genocide from a socio-historical and juridical-international law point of view.